Fiberglass mold release, mold releases, liquid wax, clear grease, and external mold release. If you want a recommendation for a mold release product, please see our Mold release recommendation form. This form will help us get enough information on your molding process so we can recommend a product for trial. Additional release agents are available on the Paste wax and Semi-permanent releases pages. 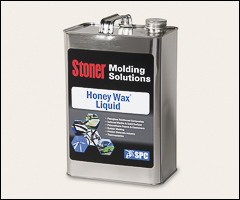 Honey wax liquid is ideal if mold surface is grained or textured, as with a non-skid pattern. Used by many cultured marble fabricators who require a dual purpose product to act as a release agent and a cleaner. Cleans old wax buildup and residues as it’s applied. And provides a durable wax surface with a high luster and a good release. Allows for long service of your equipment. Easy application with either a cloth, brush, or by spraying gives you multiple pulls without rewaxing. WARNING: Proposition 65 Label for J1045 . KantStik Release N is an external mold release in gel form. 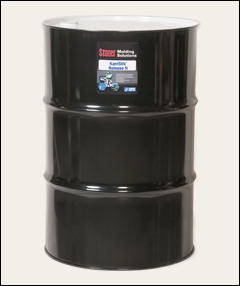 While this product is versatile, it is mostly used in the manufacture of large parts, such as tanks. In the manufacture of sinks and tubs, it also works well on the backup mold behind the basin where no luster is required. An effective release for a wide variety of thermoset resins such as polyester, epoxy, polyurethane, and also phenolic. In addition, it is used for polymer concrete composite materials. A clear grease, developed as an effective parting agent in processing molded or laminated parts. Remains stable up to 400˚F and won’t change consistency or melt at temperatures far above those ordinarily used in the molding or in the laminating process. KantStik Release N is ideal for use in layup and casting. Also used to protect platens, tooling, etc. from adhesives and excess resin.